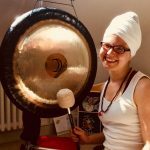 Kundalini Yoga & Gong are in my life as essential tools to live more presently, powerfully and playfully, and to accept, experience and transform challenges. I found Kundalini Yoga in 2010 when I lived in Santander in Spain, and I felt it included what I had searched for: a practise that combined working with body, mind and spirit. In 2013 I began the marvellous journey of an 8-month teacher training course, which took place in Sweden at Yoga Mangalam. At one of the retreats of the course the gongs entered my life and I have since then discovered the magic and healing of these instruments, which I with gratitude integrate into my yoga classes. Last years I have attended several Gong & Sound healing trainings, eg. with Mehtab Benton and Don Concreaux, and I now offer 1-1 Gong &/or Yoga sessions. I love the possibility to share these tools with other human beings, and therefore also offer courses, workshops and retreats to dive deeper into presence.